If your Minister, Pastor, Youth Organizer, or a leader of a church, ministry, or religious organization, you already understand that communication is key to connecting to your fellowship and community. Text messaging has become a staple in communication over the last decade. With a 98% read rate, it’s easy to understand why many are using it to save time while increasing fellowship, attendance, and donations. In this article, we’ll tell you how it works and how to implement it for your church. What is Bulk Text Messaging for Churches and How is it Different than Texting from Your Cellphone? By creating a text list for your church you’ll be able to establish different groups within your church to send different messages to. Create groups for leadership, youth groups, teachers, there are limitless options that are separate from one another. When it’s time to let leadership know what the weekly focus is, create one text message and select your leaders group, press send, and your text will automatically go to all of your leaders within that group. Send your youth pastors their own message about training sessions to keep them engaged and on the right track. Another key difference is that this group messaging is one-to-one meaning, that if you text 50 people and some of those people respond, only you will receive those replies. When you send a group text with your cellphone and people respond, all members of the group receive those replies which can get overwhelming when the group is large or active. Group text messaging is powerful, when used for these purposes because of its timely manner of delivery and high readability percentage. Text messages are delivered to each group member within 10-30 seconds of when it was sent, providing instant information. People read 98% of the text messages they receive and 90% of all text messages are read within 3-minutes or less. Utilize this as a tool for your church to get the word out quickly and effectively. Myself, as a frequent user of text messaging, have often thought about this principle of how quickly I read my text messages and it is true. If I am anywhere near my phone and hear my text message ringtone chime, I find myself grabbing my phone to find out who texted me. If you use text messaging yourself, think of this in your own experience. Do you have a similar reaction when your phone chimes that a new text message has arrived? It is safe to assume that most of you have similar experiences to mine. Now think of this in terms of your own church members. What better way to keep in touch with them almost instantly and have a near-guaranteed read. Other forms of communication–such as e-mail, phone calls, or direct mail–just don’t produce such results. Bulk group texting can seem confusing at first but it’s actually really simple once you get started and the results are well worth the slight learning curve. 1. Create a free trial account here. Your free trial will include 15-days and 100 messages to test the system with no commitment or credit card required. If you’d like, our customer success managers will help you integrate your church with our system at no added cost. This only takes about 10-minutes. 2. Upon signup, you’ll be asked to choose your keyword. The keyword is the name that people will text in to join your list. *Tip, pick a word that isn’t going to try and auto-correct or that is hard for others to spell. The following step you can complete yourself or reach out to our team and let our customer success managers walk through this with you. If you are new to bulk text messaging, we recommend that you utilize our team since these integrations can be a little confusing in the beginning. In doing so, you’ll know that your account is set up correctly and get free expert advice from our team who have helped dozens of churches integrate text messaging for their ministries. 3. Decide if you’d like to have multiple Keywords or if you want to keep your 1 chosen Keyword and create multiple Groups to segment your members into their perspective groups. The difference between Keywords and Groups is, additional Keywords cost between $2-5 a month to have but this will allow you to own more words to differentiate your lists and are a little easier to explain to members how to join from their cell phones. With the use of groups, you would use your 1 Keyword “Grace” and add a group extension name. An extension could be grace-youth or grace.clergy whenever this phrase is texted in, those members would be sent to the appropriate group, in this case, Youth and Clergy. You can have as many groups as you’d like at no additional cost. Whether you choose to use Keywords or Groups, we recommend segmenting your group members as best you can so members receive the information that is pertinent to them and don’t get messages not relevant to them. Youth group meeting Wed. @ 7 PM. Bring friends! We will discuss several topics with refreshments afterward. See you there! It was a high counsel that I once heard given to a young person, ‘Always do what you are afraid to do.’ – Ralph Waldo Emerson. Don’t forget our special Christmas worship service Dec. 25th @ 10:00AM. Normal services are Sunday’s at 9:00 AM and 1:00 PM. Come celebrate with us! 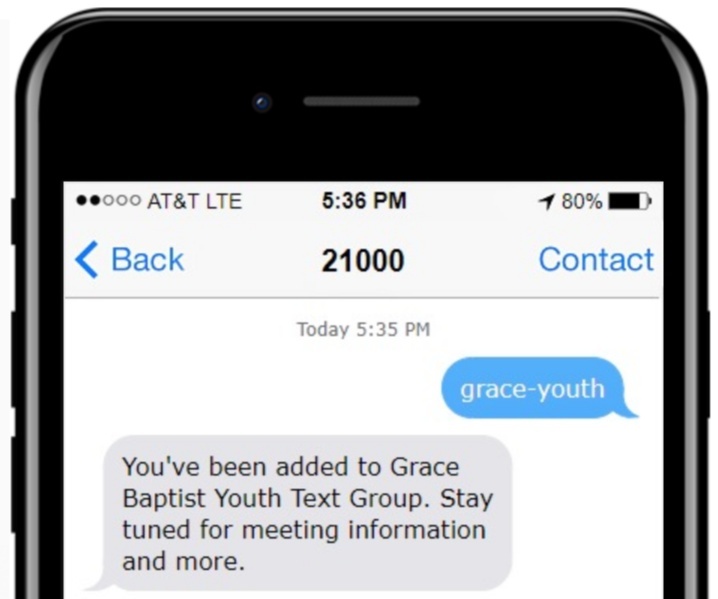 You can see, there are several ways that a group texting platform can be beneficial to churches for a variety of different uses. 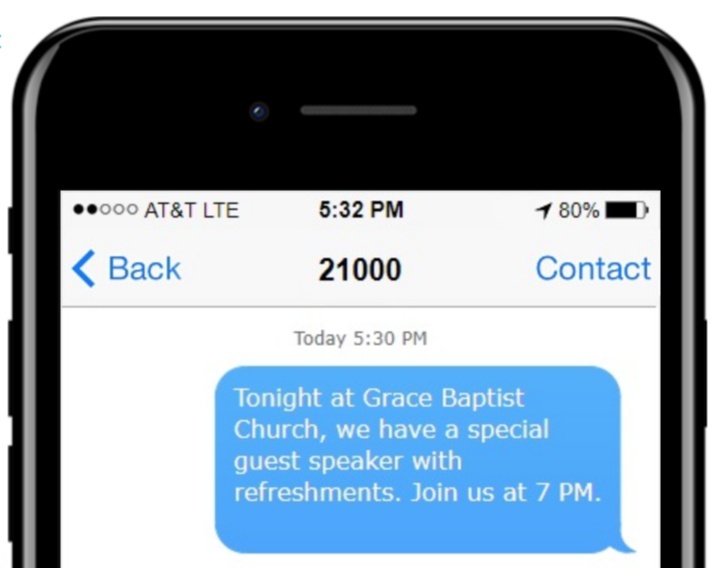 Members will be able to stay connected like never before when their local church uses text messaging as a means of communication. Text 2 Win – Engage your members with giveaways for members that donate or participate in a service project as a nice way to say thank you or get more people to participate. Text 2 Vote – If you want feedback from your members, set up a text to vote poll and get their feedback & results in real time! Message Scheduler – Save time communicating and set up messages months out into the future. If you have questions about how bulk text messaging can help unite your church and automate your messaging, give our team a call and we’ll be happy to help.